Bikes "May Use Full Lane"
Maryland State Highway Administration has added white "Bicycle May Use Full Lane" signs along the New Ave. The signs are meant to warn motorists that bicycles may be operating anywhere within a traffic lane. Read more about these new signs and their application on Maryland State Highways. Signed bike routes along Wildwood Drive connect the Takoma Langley Crossroads area of the New Ave via Anne Street, Kirklyn Avenue, and Holton Lane. Routes will be expanded along Elm and Poplar Avenues, connecting the Maryland Gateway on the New Ave with other neighborhoods in Takoma Park, and Sligo Creek Trail. 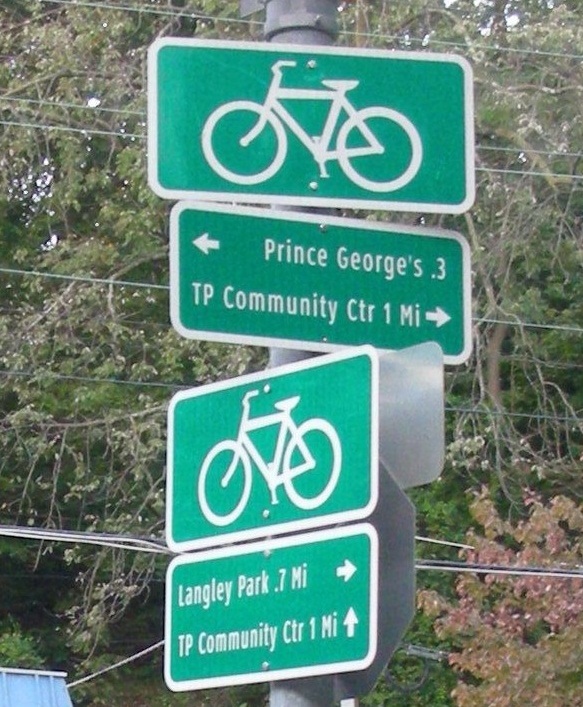 This project is funded through the Maryland Bikeways Program and will be completed in 2013. The Sligo Creek Hiker Biker Trail connects Takoma Park to Wheaton and the Northwest Branch and Paint Branch Trail systems including College Park (UMD) and the West Hyattsville Metro Station. Use the Sligo Creek Trail if you're building your bike skills, and venture onto Sligo Creek Parkway on Sundays when it is closed to traffic. There is a regional bike map where Sligo Creek Trail meets New Hampshire Avenue, to orient you on your ride. The City of Takoma Park has printed a new bike map that shows how to connect to the New Ave from othe parts of the City, and greater Washington Metropolitan Area, via bike lanes, signed on-street neighborhood routes, and regional shared-use trails. Download the bike map, and pick up your free copy at the Recreation Center on New Hampshire Avenue, Takoma Langley Crossroads CDA, and other public buidlings and bike-oriented businesses. Hoop racks have been installed in recent years at the Takoma/Langley Crossroads and at the Ethan Allen Gateway. A new bike rack style for the corridor has been selected as part of the New Ave Streetscape Standards. Bicycle commuters come together annually in May to celebrate Bike To Work Day, a free morning event hosted by the City of Takoma Park and New Ave partners like the Crossroads CDA, Takoma Park IHOP, and The Green Commuter. There is a on the New Ave at the Sligo Creek Trail to serve residents and commuters along the New Ave and the Crossroads. 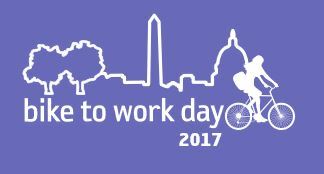 To register, visit the Bike To Work Day website.